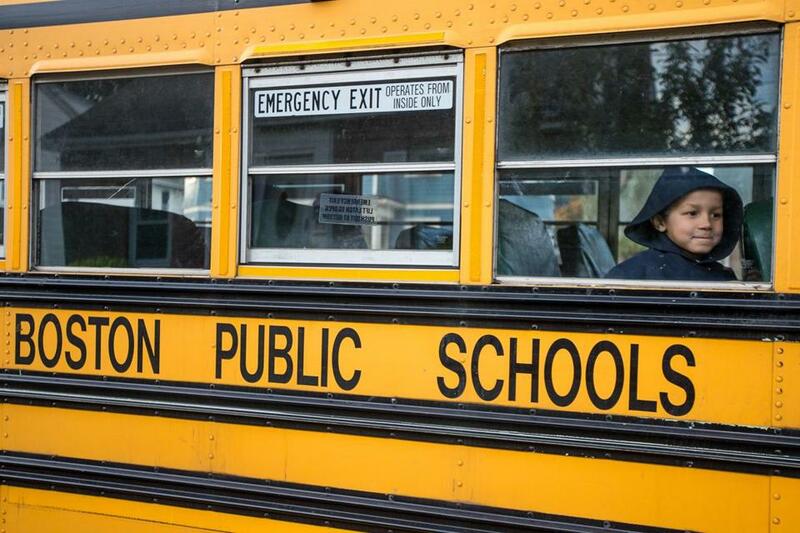 Boston’s economy is booming, but schools seem cash poor. Why? By many measures, the Boston school system should be flush with cash, thanks to the city’s booming economy. So why isn’t it? By many measures, the Boston school system should be flush with cash, thanks to the city’s booming economy. Over the past decade, the parking lots and rotting piers of the Seaport District have given way to sleek office towers and luxury condominiums, and large-scale developments have sprouted up elsewhere, including the city’s third tallest skyscraper (in the Back Bay). That has pumped tens of billions of dollars into the city’s tax base, swelling it beyond $160 billion. The new revenue has allowed Boston to increase spending on city services while keeping homeowners’ taxes among the lowest in the state, a feat Mayor Martin J. Walsh recently championed in his state of the city address. Yet earlier in January on Beacon Hill, Walsh painted a more dire picture of city finances as he asked for tens of millions of dollars more in state aid for city schools, arguing that “without these resources, we will struggle in Boston to meet the basic needs” of 55,000 students. For some political insiders, the mayor’s remarks elicited disbelief: How can the economic engine of the state not have enough money for its schools? Even parents, teachers, and advocates who have pressed the state for more aid have repeatedly asked that very question. For all the city’s wealth, the Boston school system feels like it belongs in an economically depressed industrial center. Decades-old buildings plagued by leaks. Drinking fountains shut because of lead pipe contamination. Persistent shortages of guidance counselors, nurses, psychologists, textbooks — even soap in the bathrooms. All the while, many Boston schools are under state pressure to increase their standardized test scores and graduation rates. The disconnect between the city’s prosperity and the state of its schools has baffled parents, teachers, and education advocates for years. They have repeatedly rallied at the State House for more state funding and questioned whether Walsh provides enough city money to the schools, and whether the School Department spends that money wisely. Boston’s latest push for more aid comes as lawmakers debate updating the state’s outdated formula for calculating local school aid. The formula has failed to keep pace with inflation and consequently is underfunding education by $1 billion or more, according to multiple state reports. Of importance to Walsh is ensuring Boston schools receive a minimum amount of state aid — which has been dwindling over time as the state diverts money to independent charter schools. It’s not like Boston doesn’t spend a lot on its schools: $1.1 billion budgeted this year, well more than required by the state. Since Walsh took office in 2014, he has increased spending on the school system by more than $170 million. Overall, Boston spends almost $21,000 per student, according to state data. Among the nation’s largest systems, only New York City shells out more per student than Boston, according to a US Census report last spring. So why do Boston schools appear to be so cash poor? A collision of factors creates the perfect financial storm. Like other districts, Boston has not been immune from skyrocketing health care costs, pension obligations, and special education spending. The school funding formula used by the state aims to provide only 17.5 percent of the required per-pupil spending for Boston — the bare minimum allowed under law. And little of that state money actually goes into the city’s schools, as the state diverts most of that for the tuition costs of Boston students in charter schools. The idea is that Boston needs less money because it has fewer students to educate. While those factors are largely out of Boston’s control, city officials also bear responsibility for a system that many analysts have described as unwieldy and inefficient. Many schools have about half the number of students they did a decade ago. But attempts to close them have met heated resistance. School buses — many less than half full — crisscross the city, often taking students to schools far outside their own neighborhoods, while others transport homeless students to and from shelters outside Boston, and students with disabilities to private programs in the suburbs. In all, transportation consumes more than 10 percent of the school budget, one of the highest rates in the nation. Liam Kerr, director of Democrats for Education Reform Massachusetts, said some of BPS’s financial problems have been decades in the making. City officials say they are keenly aware of a potential recession and are preparing for it. They also say they’re trying to get the system to spend more wisely, such as bringing in MIT to redo bus routes. But they also argue the state doesn’t do nearly enough. “State aid used to be an integral part of how we funded government,” city budget director Justin Sterritt said. Two decades ago, state educational aid covered almost a third of Boston’s school expenses; this year about 5 percent of the system’s funds will come from state educational aid. And city officials anticipate that in just a few years every penny from the state will instead go toward charter-school costs of Boston students. This year, for instance, Boston is slated to receive $220 million in state education aid; about $167 million will cover charter-school tuition for 10,000 students, leaving a little more than $50 million for the 55,000 students in the city school system. That has forced the city to pony up more each year, even as it seeks to expand and update schools. In the past five years, Boston has added 1,000 preschool seats, expanded the elementary and middle-school day by 40 minutes, replaced frozen lunches with fresh entrees, and purchased 50,000 pieces of new furniture, among other efforts. Still, in the district’s 125 schools, money is tight. That the state does not provide more support to the system that educates the largest number of students in Massachusetts living in poverty, the largest number of students who don’t speak English fluently, and the largest number of students with disabilities strikes many as unfair. Many parents, teachers, elected officials, and education advocates argue the state’s 26-year-old school funding formula has never treated Boston fairly. Although the formula takes into account student demographics, including income, it puts far more weight on a community’s ability to pay. Consequently, Boston is treated like an affluent suburb — even though 58 percent of students in its schools live in households that rely on government assistance. One key barometer of property values that the state uses to determine aid puts Boston slightly above the wealthy community of Concord. The end result is that the state provides Boston with the same level of aid as Concord: just 17.5 percent of the amount required for an adequate education. But the resources available in schools in Boston and those in Concord are worlds apart. Last year, a group of parents from the Blackstone Elementary School in Boston’s South End, where three-quarters of students live in poverty and almost half are not fluent in English, took a field trip to a Concord elementary school to see what a suburban education is like. The parents were greeted with a musical performance by students playing a variety of instruments. Classrooms had computers and electronic whiteboards connected to the Internet. Students home sick could participate virtually. At recess, students broke into groups and were assigned a recess coach. For instance, in music class Blackstone students beat on small cans instead of using instruments, Polanco said. The Blackstone has repeatedly had its budget cut, and for next year, the school will probably need to cut $500,000, which could result in eliminating 10 support staff positions. Polanco has contemplated whether she should move to Concord or get her son a spot in Concord through the voluntary school integration program METCO. But then she had second thoughts. James Vaznis can be reached at james.vaznis@globe.com. Follow him on Twitter @globevaznis.